The storms late in the week left many without power. Fortunately, D.C. won't need any air conditioning this weekend. Washingtonians are in for some relief as a marine layer brings cool weather to the area. Cloudy cover will accompany temperatures in the low- to mid-80s. 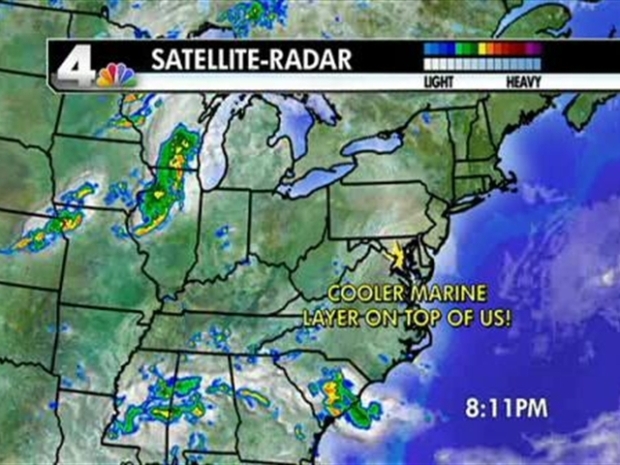 There may be some stray thunderstorms out west, says NBC Washington meteorologist Kim Martucci. But the moisture over Indiana and Illinois today won't arrive until Monday. There will be rain and thunderstorms on Monday and Tuesday, with temperatures climbing into the upper 80s. Today and tomorrow are days for getting out. A cool marine layer is bringing relief to the area this weekend.